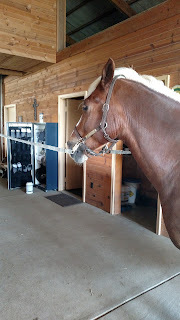 I wrote yesterday's post about riding Phoenix before I had my next lesson. 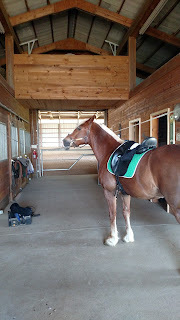 For this one, my trainer came to the new barn to give me a lesson, which was much appreciated. I don't mind trailering, but it was REALLY nice to leave my house at 3:25 for a 4pm lesson. And I wouldn't even say this is the best example, but I'm lazy and this was the first one I found. Which means I'm pulling on him and the connection is constantly changing. Not saying the top picture is perfect, but it's better than pulling right now. So the whole lesson I was thinking "thighs off, hands forward", and it ended up being the best the connection has ever felt. Something about the way I sit - and I think it's in my thighs - drives him forward into my hand, making a heavy horse feel even heavier. I was much more able to regulate the tempo with my seat when, y'know, I wasn't clamped down on him. 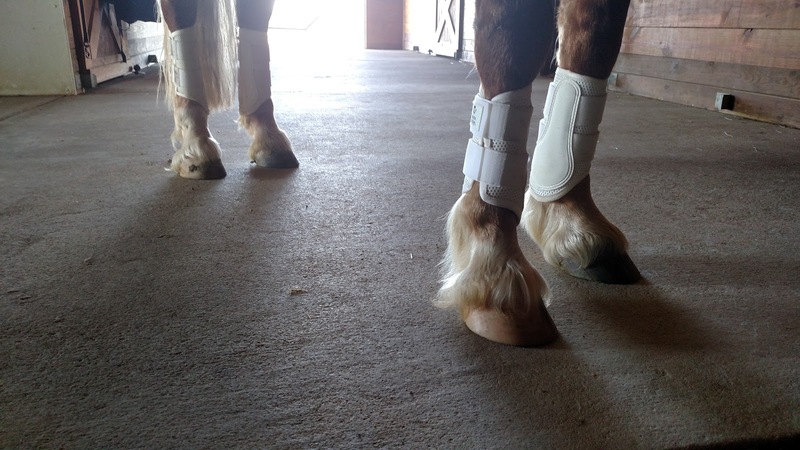 Old Majyk Equipe boots, still looking pretty good! 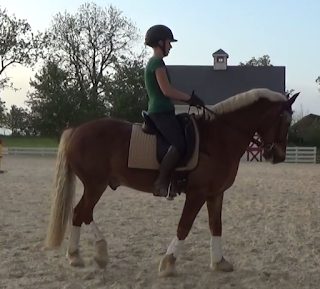 For the lesson, she wanted to work on the down transition from trot to walk, because he tends to get flat immediately. 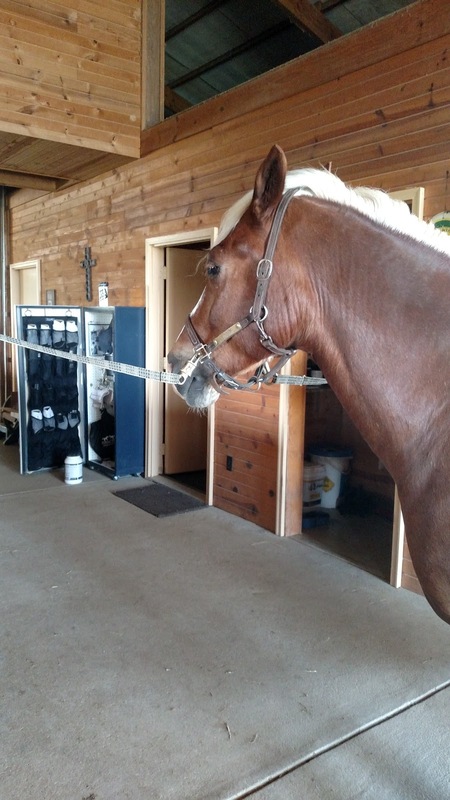 She wanted to do an exercise in which we come down the centerline in the trot, begin a trot half pass in the direction of travel, change bend and go shoulder fore in the new bend direction, with a down transition right after we change bend. I tried it twice and told her he wasn't on my aids enough to give me what I needed for that exercise. I also was having a hard time with all that plus "thighs off, hands forward". So she thought about it and then came up with a modified version: two 15-ish meter trot circles (figure 8) in shoulder fore, change bend/engage new inside hind, down transition to walk shoulder fore in new direction, pick up trot, repeat. The idea is that by asking for the new bend and engaging the new inside hind before the transition, he never gets the chance to "switch off". I'm glad you were able to get a good lesson and good ride at the new place. Is it starting to feel more like home arena for you and Connor yet? I am struggling with almost precisely that same lesson about elbows & hands right now. I am trying to keep my elbows responsive and my hands still without breaking at the wrist and/or otherwise choking him off. Sometimes I feel like a saddleseat rider, my hands are so far out there. So nice to be able to have a lesson at your new home arena! I agree with above, your position in the first pic above - wow!